A Nicholas Taber Panel Raising Plane--with a Story. S.S. Brittain & Co. Commemorative Hand Saw. On a recent trip to my favorite local auctions in central Maine, this breast drill popped up in an early Sunday morning auction. I had to have it, and although the bidding was fierce, it was mine for $6. I'd never seen one like it. 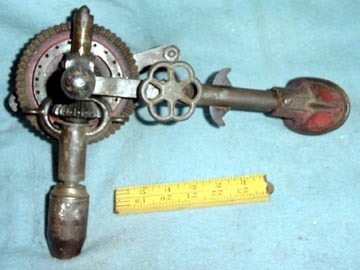 The obvious interesting features were a chain drill function, and a mechanism for tilting the shaft through an axis of more than 90 degrees. 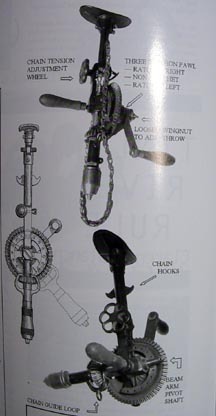 The knob on the upper shaft tensions the chain holder. 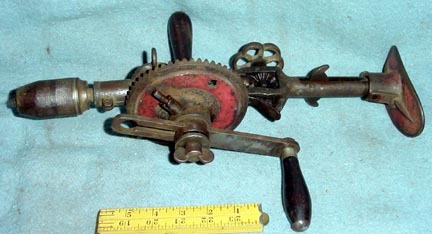 With no markings other than an early Millers Falls patent chuck, this looked to be a puzzle. But within a day after coming back home, the latest Fine Tools Journal (Vol. 52, No 2) arrived, and there was my drill! An article by Jim Schoenky identified the drill as an example of McClelland's Nov. 6, 1900 patent for a "Universal Brace & Drill." With its body that rotates more than 210 degrees, right and left ratchets, tensioning chain attachment, adjustable torque handle, adjustable breast pad, two speeds, and post drill attachment, this is (as Jim says) the "Swiss Army Knife of breast drills." He estimates 20 to 40 specimens and a value of $250 to $400. So it's a gloat!